Refer a friend and get 50% of their first deposit up to $10. Your friend will also receive $20 if he or she deposits $20 or more. Maria Bingo is one of the largest online European bingo communities around. They have been around since 2006, offering 90- and 75-ball bingo games. The UK rooms only offer 90-ball games, but you'll find different games based on the price, the starting pot, the contribution to the jackpot and the probability of winning the whole jackpot. You'll also find international games, guaranteed jackpot games and daily prizes. With the focus being on the European market, it's no surprise that you can play in many different languages and currencies. There's a good customer service team waiting to help you and upon sign-up you can get a 100% bonus up to £100. Chatting is a big part of the Maria Bingo community, as it is at every major bingo operator. The Maria Bingo chat moderators are friendly, helpful and will keep you entertained with some great chat games. When you are chatting, you are allowed to use all of the languages in the chat that your moderator understands. If you’re in a Scandinavian room for example, you can use all of the Scandinavian languages and English. And just like every chat room, there are rules and etiquette to live by, so make sure you follow the guidelines. In the end, the chat function adds great interactivity and entertainment to the games and with the prizes that can be won, there are plenty of reasons for players to smile. Maria Bingo hangs its hat on a 70% pay-out percentage, which is considerably better than what you get at state monopolies. That said, there's a lot of winning going at this bingo operator and they are proud to show it. The 'winners' section of their website shows a real-time map where all of the winners are shown. 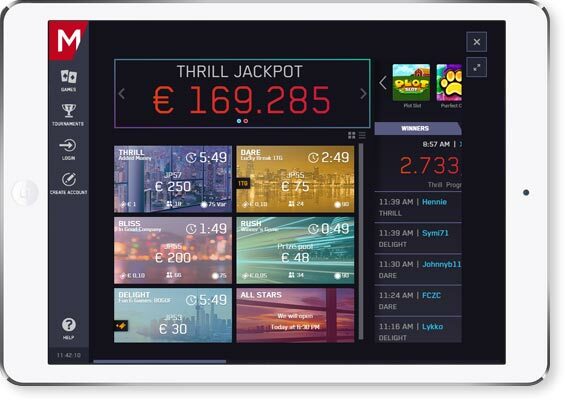 You can see which users got lucky, how much they won and in which room the winnings were collected. If you want to connect with bingo players from all over the world in a casual, friendly and winning environment, there are few better places than Maria Bingo.